The 24th China Yiwu International Commodities (Standards) Fair ended with success in Yiwu City, Zhejiang Province, China on October 25, 2018. As the largest exhibition in Zhejiang Province, this year's Yiwu Fair provided 4,136 international standard booths, attracting 2,150 exhibitors from foreign countries including US, Russia, Germany, and Portugal, as well as from China’s 26 provinces, municipalities and autonomous regions. The Fair provided a total exhibition area of 100,000m2 in 10 halls, covering 14 industry sectors. Special area included “Made in Zhejiang”, standard themed exhibition, fashion, Pujiang crystal, pet supplies, lockset, international brand alliance, luggage, fashion accessories, mart lifestyle, Yicaibao exhibitors joint exhibition, innovative design, Women's Federation handicraft, Mountainous-Coastal Collaboration, e-commerce and trade services, and cross-border e-commerce. More than 60,000 transactions and cooperation intentions were reached, with a total turnover of RMB 18.428 billion, up 3.1% year-on-year. During the five-day event, Yiwu Fair attracted 204,695 visitors and buyers, up 13.09% year-on-year. Among them, 58,462 were professional buyers, up 2.8% year-on-year. The number of overseas buyers reached 8,066, coming from 179 countries and regions, among which the top ten were: India, Pakistan, South Korea, Yemen, Taiwan, Egypt, Iraq, Indonesia, Afghanistan, and Malaysia. 56 out of the 65 “Belt and Road” countries and regions exhibited at the Yiwu Fair. This year saw the debut of the “1+1+X” standard exhibition areas at Yiwu Fair, namely, 1 “standard” themed area, 1 “Zhejiang Standards” brand themed area, and multiple industry standards demonstration areas. This move is designed to promote quality improvement and international trade with standards. And Yiwu Fair joined hands with “Zhejiang Standards” for the third year to showcase products representing the highest Zhejiang standards. 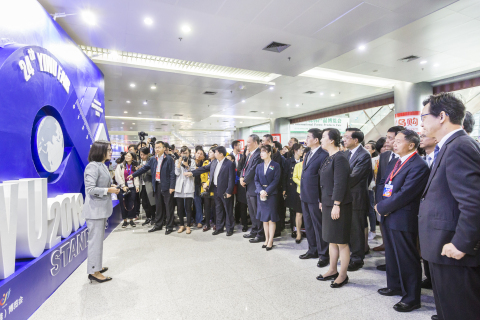 Many conferences and business-matching meetings were also held during the Yiwu Fair, including the 15th China Standardization Forum, the Small and Medium Enterprise Standardization (International) Conference, 2018 China Retail Industry Department Stores Procurement (Yiwu) Summit, 2018 China Yiwu Design Week, 2018 Cross-border Masters Summit. These supporting activities were supposed to promote small commodities trade negotiations and SMEs cooperation, as well as build Zhejiang and Yiwu into the origin of global small commodity standards.